The May 17 top-level meeting between Russia and Syria was significant for its immediate outcomes, since the two presidents discussed a number of key matters, as well as for the way it fits into the international context surrounding the Syrian settlement process. Also taking part in the talks were Russia’s acting ministers of foreign affairs and defense, pointing to the importance of the meeting in terms of military strategy and international politics. However, it was the economy that was center stage. Of course, keeping the political process on track is essential for any improvements in the economy. The country was once known for its inclusive economy focused on supporting entrepreneurship and offering a robust social safety net, especially to the most vulnerable population. People saw these efforts by the government, which guaranteed popular support in the subsidized sectors of the economy. The agenda has now changed, as Syria faces the task of restoring its infrastructure and production in all sectors. Achieving this goal would be impossible without opening the Syrian economy to foreign investment and a serious effort to draw investors into the country. The meeting participants discussed Russia’s involvement in Syria’s post-conflict recovery. Specifically, they talked about investment by Russian companies that are already expanding their footprint in various sectors of the Syrian economy. Russian companies can expect preferences and financial support for their projects related to post-conflict recovery in Syria. During the meeting the Syrian president thanked Russia for the humanitarian aid, and it is true that its deliveries did a lot to ease the suffering of the Syrian people. However, radical initiatives are needed to put the economy back on track. There is no doubt that major powers with their enormous resources, including the global status of their currencies, could be tempted to take advantage of the current situation in order to put the Syrian economy, and eventually the political leadership, under their control, directly or by proxy. Aware of this possibility, the Russian leader insists on collective, UN-led efforts to promote post-conflict recovery in Syria, which even includes the drafting of a Syrian constitution, as was discussed at the meeting. It is for this reason that as a reliable partner with a differentiated, equidistant Middle East policy, Russia has every chance to secure for its companies an immediate role in efforts to rebuild the Syrian economy. The May 17, 2018 meeting was preceded by a number of important events that were directly related to Syria. On May 14 and 15, Astana hosted talks on the joint steps by the three guarantor countries to promote a political settlement in Syria. On May 10, Syrian air defense faced yet another attack when Israeli aviation targeted Iran’s Quds Force in Syria. This was a massive retaliatory strike following an air incursion. Hundreds of missiles were launched, resulting in human casualties for the Syrian army and loss of missile defense systems (it was reported that BUK and Pantsir-S1 missile systems were destroyed). Israel’s attack was a response to the shelling of the Golan Heights, allegedly coming from the deployment site of Iran’s Quds Force in Syria. The Iranian attack, in turn, is viewed by some as a response to the May 8 decision by the US president to pull out of the Iran nuclear deal (JCPOA), as if the withdrawal from the agreement somehow enabled Iranians to launch direct attacks against Israel and the US. Looking at these circumstances and the events as they unfolded, one cannot fail to question the possible consequences of the anti-Iran hysteria in the US and Israel and Iran’s intention to export its policy. So far a direct military confrontation seems unlikely, although in Syria these two sides may continue to exchange blows indefinitely, which would be damaging both for Syrian territory proper and for occupied Syrian territory (the Golan Heights). The dire situation along the Turkish border is also worth mentioning. It is clear that the Turkish leadership has no intention to show any understanding for the Syrian president. In fact, Syria has become an arena of de facto war on the Kurdish rebels, which has nothing to do with counter-terrorist efforts. Of course, it is impossible to ignore the interests of any of the countries involved in the Astana Process in this rapidly changing environment. That said, the need to take them into consideration must lead to compromises. If one country insistently pursues its interests in a country that has been devastated by various conflicts over the past seven years, this inevitably turns the heat on in all the possible bilateral regional conflicts and disputes, even those that are latent. The Sochi meeting between the Russian and Syrian presidents (by the way, the same city hosted the Syrian National Dialogue Congress last winter, and there are already discussions on holding the next meeting of this kind) was just one of the many top-level foreign policy meetings in Sochi (for example, with Angela Merkel, Narendra Modi and Rumen Radev), which is indicative of the well-balanced and multidimensional foreign policy of the Russian president. The recent meeting between Vladimir Putin and Prime Minister of Israel Benjamin Netanyahu has probably become a sticking point in Moscow’s relations with Syria, since it was followed by Israel’s air strikes against Syria. The exchange of air strikes between Iran and Israel was clearly a provocation, which makes it extremely unfortunate that it was Syria that suffered from these actions, while Moscow was blamed for them, as if Russia was somehow responsible for the actions of its Israeli guest, as well as for its partner from the Astana Process. Of course, Russia has nothing to do with the relations between Iran and Israel, even when they play out in Syrian airspace. By refraining from interfering, Moscow acted in keeping with this vision. But if both sides continue to engage in operations of this kind, this would wreak havoc in the regional conflict with its shifting agendas, taking into consideration the dire situation of the Syrians, and the rising discontent among the Sunnis over the growing influence of a Shia state in their country, the threat of losing the country’s east, and scarce opportunities for a quick economic recovery in Syria. 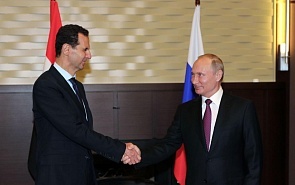 It was probably very important for Assad to hear Vladimir Putin’s words that “foreign armed forces will withdraw from the territory of the Syrian Arab Republic.” This is essential for restoring the country and will happen at one point or another, especially since it seems that the Russian president was referring to forces that operate in Syria without any legal basis. It can be argued that the Syrian leader understood these words as a reference to the forces of the so-called Western coalition, and maybe also to the presence of the Turkish army in the country’s north. It is also possible that the Russian leader referred not only to those who “do not want stability in Syria,” as Bashar al-Assad said, but also to Russia’s closest partners among the three guarantors of the Syrian peace process. Iran’s operations in Syria go far beyond fighting terrorists and are hardly welcomed by anyone within the region and beyond. This heightens tensions in Israel’s relations with its bitter rivals, as did the outrageous decision by the US to move its embassy to Jerusalem, which opened on May 14, 2018. Serving as a platform for fighting the “Zionist” enemy is something Syria needs the least. Russia seems to lack the authority and the desire to prevent regional powers from using Syrian territory to settle their accounts. The only hope is that the three guarantor countries engage in further consultations in order to persuade at least one of the sides to show more moderation, while established diplomatic and other channels with the other sides could help preserve a fragile peace. This would also serve the interests of Syria and its people.